…is absolutely gorgeous. It’s a damn shame we only ended up staying for 2 days out of our planned 4. We came in on Monday night and ate up in a little ghost town outside of the park and then headed into the Chisos Mountains Basin. We set up camp with 35mph wind gusts and some crazy lightning. Luckily it didn’t rain because my rain fly was on backwards. Next time I get a new tent I’ll set it up before I take it out. We headed out on the Pinnacles Trail the next morning at around 10am and slowly made our way up and out of the basin, into the High Chisos. The views were spectacular, but climbing 2000′ over four miles with our packs was not. After making it to our first backcountry site in Boot Canyon, we lounged around for a bit and I managed to sneak some reading in. Out of nowhere, hail started coming down, causing us to scurry about to set up camp. With our tents pitched and the sudden storm seemingly out of our hair, we tossed our food into the bear lockers and headed off towards Emory Peak. Two miles and 1000′ later, we hit the summit. 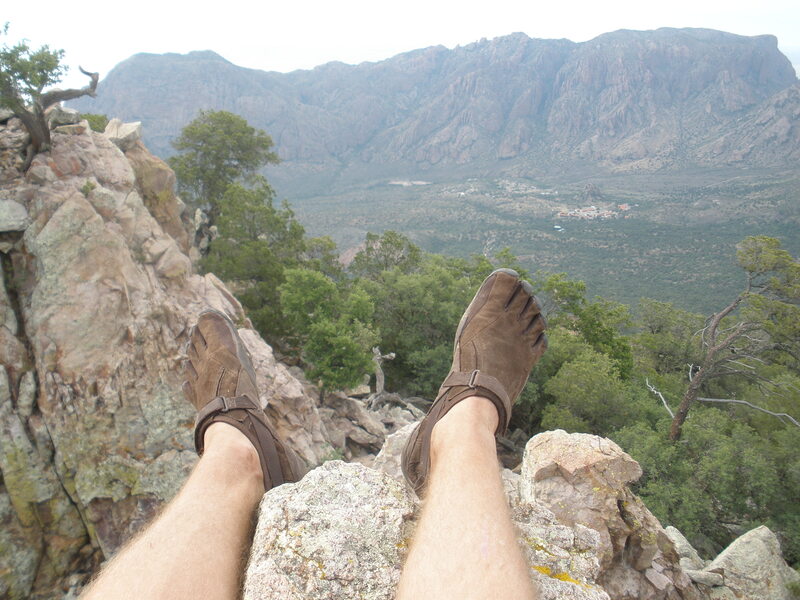 At 7831′, Emory Peak is the second highest in Texas. It’s way higher up than I’ve ever been in my life and it’s a sight I won’t soon forget. Another two mile hike, completely devoid of water and food, brought us back to camp. As I rounded the corner coming in, something seemed amiss. A few wrinkles lined the backside of my tent. Upon closer inspection, the big tent was collapsed and hanging by pieces. We did the one thing the ranger told us not to do – set up our tents and leave camp, regardless of whether or not there was food in them. After much debate, Rob and I decided to make the hike down into the basin right then and there and camp in the car. Steve and Andrew wanted a hot meal and nothing to do with any more hiking that day. They elected to make the hike in the morning. We set off at 8:45pm, about 20 minutes before dark. We made great time and made it to the lip of the basin, a good mile from our camp, as the forest darkened around us. Unfortunately, a lightning storm was moving over the basin, and fast. I’d never seen anything like it before. It was the most beautiful and quite possibly the most frightening display of nature that I’ve ever had the pleasure and misfortune of witnessing. We managed to avoid becoming a lightning strike statistic and made it to the basin campground just over two hours after we started the hike. We were a little wet, but alive. The other two came in the next morning and we exchanged our separate stories and headed out to see the Rio Grande before going home. With both of our tents damaged, there was no way we could stay out there with flash lightning storms rolling in every afternoon and evening. It was an experience, to say the least. It wasn’t exactly what we were looking forward to, but we learned a few important lessons and I witnessed the beauty of nature firsthand, an image that I’ll likely hold close to my heart for the rest of my life. I only hope that others may be so lucky.